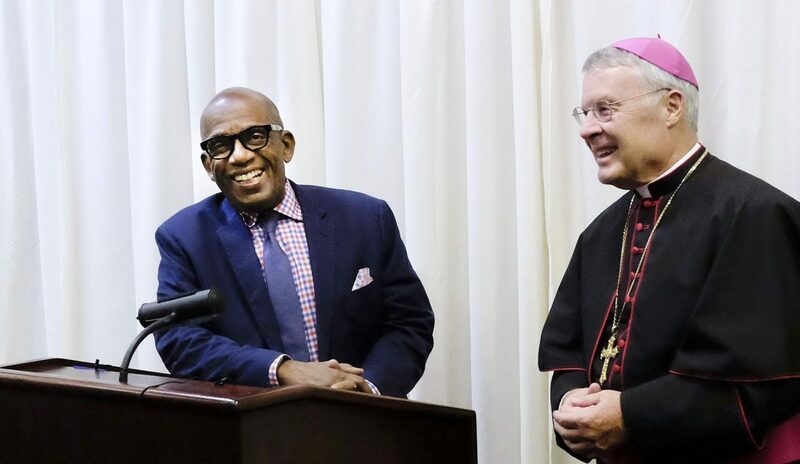 SIOUX CITY, Iowa (CNS) — Al Roker, weather and feature anchor on NBC’s “Today” show, told a Sioux City Catholic audience that he owes his success in life and his career to the Catholic education he received growing up. Roker received a full scholarship to Xavier High School, “a Jesuit military academy,” in Manhattan, he quipped during his keynote speech at the Sioux City Diocese’s annual fundraiser for Catholic schools in late September. Roker is the oldest of six children who grew up in the New York borough of Queens. His father was a bus driver and his mother was a homemaker. He attended St. Catherine of Siena Elementary School in Queens. He said one of the people who was influential in his life was Sister Emanuela, a Dominican nun. The dinner raised $150,000 this year, which was $30,000 more than last year, according to Kristie Arlt, diocesan director of communications and stewardship. The 20th annual dinner opened with an invocation by Father Ed Girres, pastor of St. Cecilia Church in Algona. It was the 10th dinner for Sioux City Bishop R. Walker Nickless, who was named by Pope Benedict XVI to head the diocese in November 2005. Borkowski writes for The Catholic Globe, newspaper of the Diocese of Sioux City. Xavier Nation, remembers & loves you too.